As we all know, humans haven’t evolved to sit down for long periods of time, due to which, we end up with injuries and issues because of poor posture and insufficient support. This makes purchasing a reliable, comfortable PC chair all that more important. Unfortunately, despite its importance, many people don’t consider getting a supportive chair until it’s too late. noblechairs have recognised this issue and claim to offer a supportive, ergonomic chair made from superior materials. The EPIC from noblechairs arrives with fully adjustable arm-rests, a solid steel construction, PU leather (with real leather also available), thick gauge stitching, cold-formed foam, a pair of support cushions, up to 149° of adjustment at the back, and of course, a racey yet classy appearance. At the time of writing, there is currently 15 different colour variations available; we’ve been supplied the PU leather black and red for review. All of those aspects certainly sound good and the ICON impressed us hugely back in August, but how does the EPIC stack up? We’ve spent a month with the chair, so read on to see what we thought. 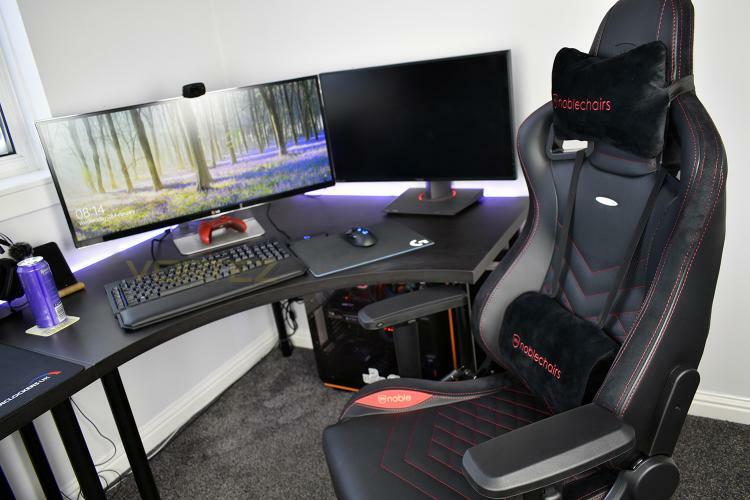 Achieving excellence is not a single act, but a habit – and our ambitious EPIC Series represents the culmination of the ambition to create the very best gaming chair possible. Endeavouring to create the ultimate no-compromises EPIC Series, we developed it utilising the precision and durability of German design and paired it with none other than 100% vegan PU imitation leather for maximum comfort and breathability.